This large, deciduous fern has feathery, mid-green fronds which form a distinctive shuttlecock shape. An excellent companion for shade-loving woodland plants, it's perfect for a partially shady, moist, humus-rich border sheltered from strong winds. One of the most colourful ferns for the garden, the Japanese Painted Fern has silvery-grey fronds which are dusty purple towards the center. They are set off by the purplish-red veins and stems. This fern has a low and mounding habit, slowly spreading by rhizomes to form dense colonies. The fronds are positioned in a way that creates a horizontal layering effect much like you see in Dogwood trees. Athyrium 'Pictum' grows best in moist soil in light to partial shade. Some sunlight is necessary to produce the vibrant colouring. Upright bright green fronds gradually unfurling then turning bronze in autumn. This deciduous regal fern is perfect for the moist margins of a pond or stream in sun or partial shade. Best planted in fertile, humus-rich, acid soil, the lacy-textured foliage contrasts well with plants like rodgersia and skunk cabbage with large, coarse-textured leaves. The shuttlecock fern is one of the easiest to identify, its fronds making a large, striking and unmistakable shape. Although happy in shady, humus-rich borders among other plants, it looks best grown in groups on its own in dappled shade, in woodland, rich damp grass or in a shady pond margin. The plant spreads slowly by underground rhizomes and, in time, builds up large groups on its own. The offsets can be dug up and moved in spring, but plants look best left to form colonies. The Royal Horticultural Society has given it its prestigious Award of Garden Merit. The Japanese Holly Fern has dark green, glossy, pinnate fronds and does not really look like a fern at all. Highly suitable for dry shade. Evergreen, easy to grow, and exotic in appearance. Supplied in approx. 1 litre containers. This extremely classy selection of easy to grow, decorative ferns that give exciting contrast in foliage, form and colour. Suitable for any moist soil, in sun or partial shade, where they are sure to glisten like jewels. Many ferns thrive in the lower light levels of a wooded area, and add architectural interest planted in bold swathes or scattered through other plantings. Flowering plants may not thrive in darker and comparatively gloomy situations, but ferns may be cultivated with success in these situations. 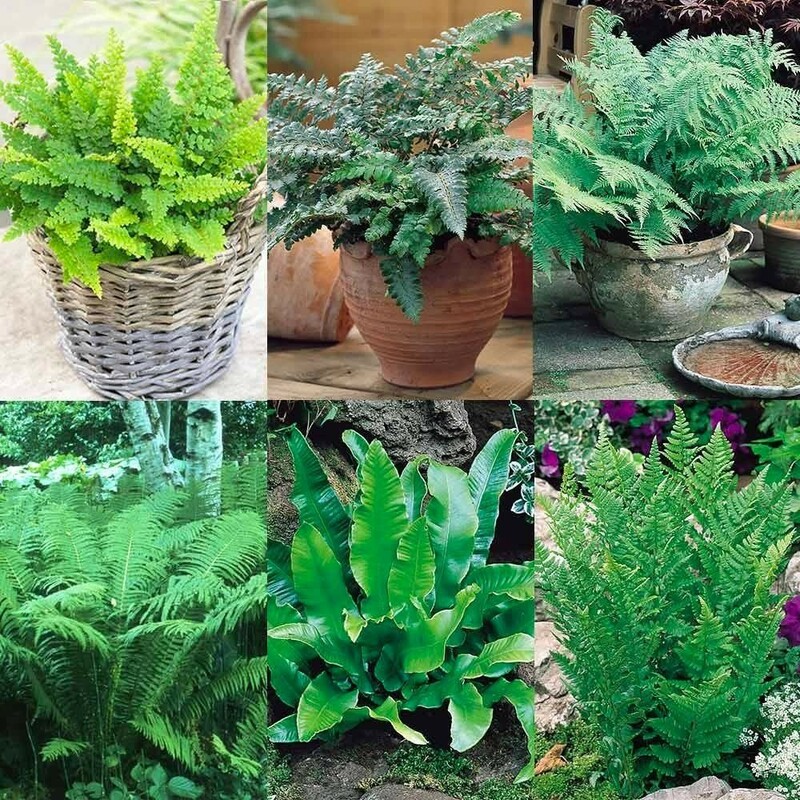 Each plant is supplied in an approx 1 Litre container - for these special varieties, this represents and an outstanding value way of adding ferns to your garden.